We’re always happy to help members of the media. 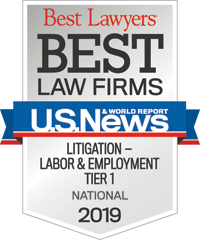 If you’re looking for someone to talk to on background, participate in interviews or contribute guest articles or editorials, we have nearly 200 attorneys with diverse perspectives and fresh angles on the policies, trends and legal challenges in today’s rapidly changing workforce. We also publish a wide range of content to help you stay up-to-date on the latest topics. Follow us on Twitter, LinkedIn or Facebook for the most up-to-date news and happenings. Here are a few of things that have been happening at Constangy lately. If you’d like to be added to our distribution list, email Stephanie Hendricks at shendricks@constangy.com. Christopher Pardo Named to HNBA "Top Lawyers Under 40"
Working Mother Names Constangy Among "Best Law Firms for Women"
In the News: #PayMeToo - the next wave of class actions? In the News: Annual Performance Reviews - Yes or No?